True Mediterranean salad made with couscous, lentils, quinoa, sundried tomatoes, herbs and spices. Ready to serve, hot or cold. A healthy substitute for rice or pasta in a main dish or as a side. Top with chicken, fish or meat to create a complete, easy-to-prepare meal. Ingredients: Couscous, lentils, quinoa, sundried tomatoes, basil, Soybean oil, salt, spices, citric acid. Preparation Instructions: Cold: thaw and serve. Hot: thaw, heat in sauce pan or microwave to desired temperature. 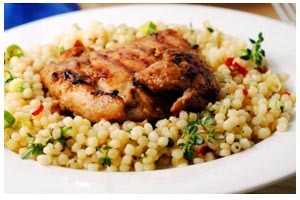 Bring Couscous Salad to your restaurant today. Contact us or download a spec sheet to learn more.